Much like the gluten-free diet itself, finding the top gluten-free travel destinations requires research and planning. Thankfully, gluten-free travel has become “trendy,” just like the gluten-free diet, creating an opportunity for companies such as TravelSupermarket.com to help do the research for you. TravelSupermarket.com pulled restaurant reviews from 250 cities around the world to create a list of the top 10 destinations based on their gluten-free dining offerings. 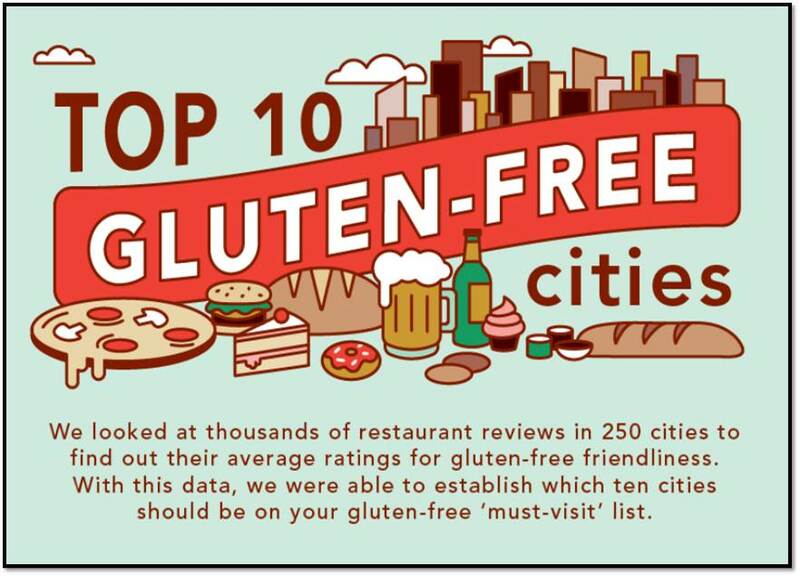 It began by compiling restaurant and bakery reviews by city from TripAdvisor, using the dietary restrictions filter to find only the gluten-free options. It arrived at the top cities by looking at the total number of reviews, percentage of reviews rated four or five stars, and the average rating to create the rankings. Chicago comes in as the top U.S. city with a whopping 240 establishments, followed by Portland, Oregon (181); Denver, Colorado (150); Maui (132); and San Francisco (138). Unfortunately, the list doesn’t mention the names of the establishments for each city or how they were compiled. (I only found out by contacting TravelSupermarket.com directly.) Since it only used one travel site for research, any reviews from other sites were left out. Their findings, while intriguing, aren’t as helpful or useful as they could have been with a larger set of data. We appreciate the effort, but the site left out several U.S. cities that are “must-visit” destinations. Some of our favorite cities for gluten-free travel include Boulder, Colorado; Las Vegas; Austin, Texas; New York City; and Asheville, North Carolina. These destinations are known in the gluten-free community for accommodating those following a gluten-free diet, as well as other allergens. In addition to the five U.S. cities determined by TravelSupermarket.com, the top 10 gluten-free travel destinations included Prague in the Czech Republic, with 102 establishments for those following a gluten-free diet; Auckland, New Zealand (180); Amsterdam in the Netherlands (210); Barcelona, Spain (270); and Dublin, Ireland, with 330 gluten-free-friendly locations. When it comes down to having a successful trip, research and planning are the keys, but they don’t have to be as time consuming as they once were. Start by searching for local support groups and bloggers in the area and tap into their resources when looking for safe places to eat and shop. The hotel or bread and breakfast in which you are staying is another great resource. Let your fingers do the walking and use apps from Find Me Gluten Free, Gluten-Free World or Gluten Free Passport to read reviews on cuisine and service. The top travel destinations in the U.S. are, in the end, subjective and what you make of the experience. With some planning and research, you can enjoy a stress-free, yummy vacation.